Class: It’s not for everyone. And neither is Joy-Based Living. One of our JBL members, deJoly LaBrier, just posted this in our private Basecamp community and I am sharing it with you with her permission because it is golden. She is just so freakin’ authentic and I love that! Feeling overcome with gratitude for the whole JBL tribe, after dealing with some really “normal” people who don’t get it that “normal” isn’t all it’s cracked up to be. They don’t realize (or take ownership) that they are wounding, abandoning or betraying me or each other. Sarcasm is rampant. And shaming is the first thing out of their mouths, even when they don’t mean it to be shaming. I can’t tell you how grateful I am that we practice the healing fields as much as we can, in a conscious way, and hold ourselves accountable for our words and actions when we use the wounding fields on occasion. Being among “normal” people is exhausting and there is a time-lag for recovery. I see myself spending less and less time in that environment. And although my world is smaller because of it, I enjoy my world more. I feel heard, seen, loved and supported. YAY! JBL!! Her words are an excellent example of great leadership. They inspire the community and validate the rest of us who feel the same. They normalize our experiences. They unite people in our community with each other. And they strengthen us individually. Joy-Based Living, as you can see, is truly NOT for everyone. It takes courage and cajones. 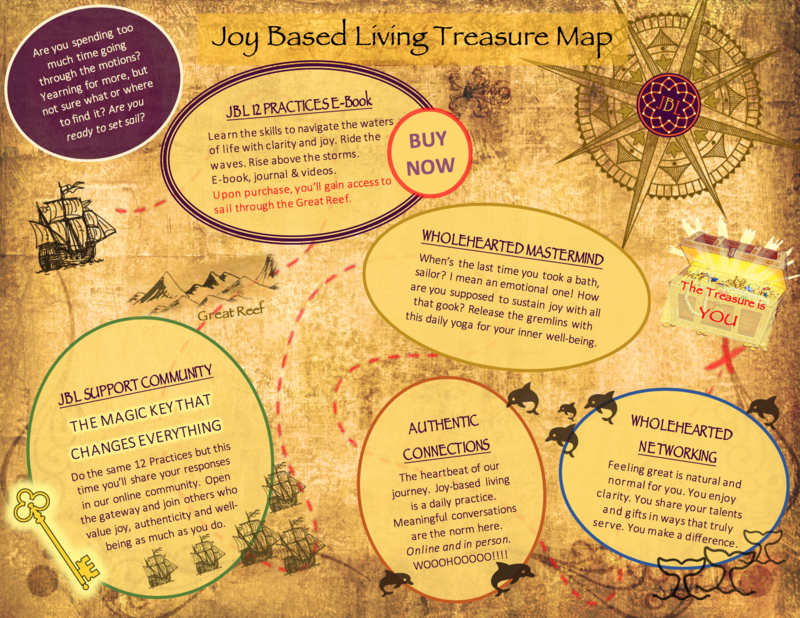 By the way, our JBL Basecamp community can be accessed once you go beyond the self-study E-book, Here’s the JBL Treasure Map. Click the map to enlarge it. If you feel called to join us, start with the E-book. Always Remember – YOU ARE THE TREASURE!